Land restoration is the process of ecological restoration of a site to a natural landscape and habitat, safe for humans, wildlife, and plant communities. Ecological destruction is usually the consequence of pollution, deforestation, salination or natural disasters. Land restoration is not the same as land reclamation, where existing ecosystems are altered or destroyed to give way for cultivation or construction. Land restoration can enhance the supply of valuable ecosystem services that benefit people. Land restoration can include the process of cleaning up and rehabilitating a site that has sustained environmental degradation, such as those by natural cause (desertification) and those caused by human activity (strip mining), to restore that area back to its natural state as a wildlife home and balanced habitat. 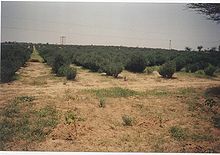 Jojoba (Simmondsia chinensis) plantations, such as those shown, have played a role in combating edge effects of desertification in the Thar desert, India. Stabilizing and fixating the soil is usually done in several phases. The first phase is fixating the soil to such extent that dune movement is ceased. This is done by grasses, and plants providing wind protection such as shelterbelts, windbreaks and woodlots. Shelterbelts are wind protections composed of rows of trees, arranged perpendicular to the prevailing wind, while woodlots are more extensive areas of woodland. The second phase involves improving/enriching the soil by planting nitrogen-fixating plants and using the soil immediately to grow crops. Nitrogen fixating plants used include clover, yellow mustard, beans, etc., and food crops include wheat, barley, beans, peas, sweet potatoes, date, olives, limes, figs, apricot, guava, tomato, certain herbs, etc. Regardless of the cover crop used, the crops (not including any trees) are each year harvested and/or plowed into the soil (e.g. with clover). In addition, each year the plots are used for another type of crop (known as crop rotation) to prevent depleting the soil on specific trace elements. A recent development is the Seawater Greenhouse and Seawater Forest. This proposal is to construct these devices on coastal deserts in order to create freshwater and grow food. A similar approach is the Desert Rose concept. Another related concept is ADRECS – a proposed system for rapidly delivering soil stabilisation and re-forestation techniques coupled with renewable energy generation. ^ "what power is needed to pump seawater to the middle of the Gobi Desert for desalination in the SeaWater Greenhouse?". "Global Restoration Initiative". World Resources Institute. This page was last edited on 9 March 2018, at 14:29 (UTC).